Astonishingly, yesterday evening did actually end on a high note. In spite of the runs, we were determined to go on a night drive (otherwise our entire visit to Erindi was, basically, pointless). 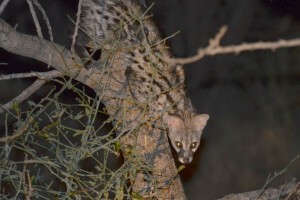 Although the aardvarks and porcupines were still in hiding and the otherwise perfect moonless night was bafflingly quiet, we did have the surprise luck to spot another leopard as well as a beautiful view of the small-spotted genet we had been glimpsing at night right through our trip all the way back to Erongo. And when we finally got back to our room, at just past 12:30, we took one last look through the curtains out onto the balcony… and there was a brown hyena, trotting along at the edge of the floodlit area around the waterhole. He trotted into a dip, picked something up, and then trotting back into the darkness and was gone. 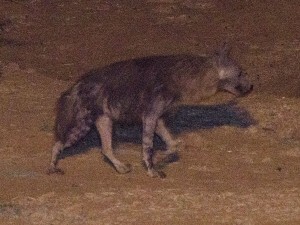 Rewind, and I can just explain that I love hyenas, and the brown hyena is the much rarer and shyer cousin of the gregarious spotted hyena that you always see fighting over lion kills. So it really was our target species for the trip, and yet with the most common sightings being around Swakopmund, Toko or Etosha we had basically assumed we weren’t going to see it. Today we’ve basically bummed around Erindi for eight hours, with really absolutely nothing to do. 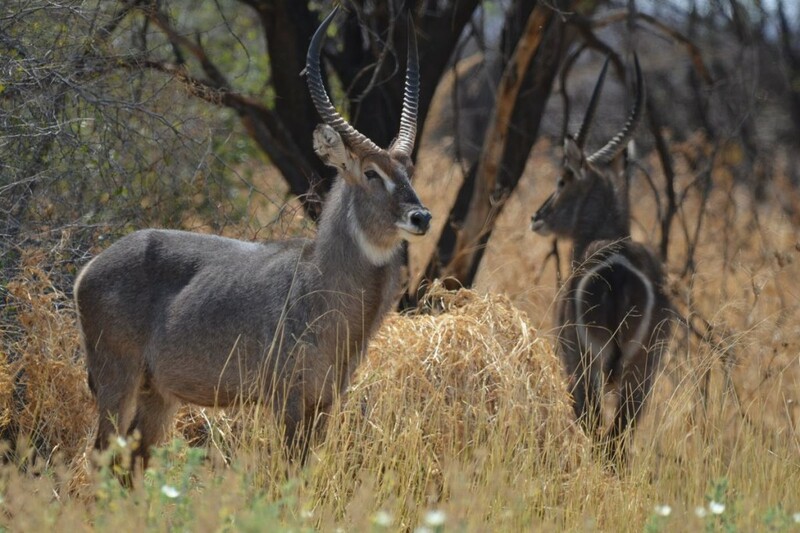 We did go for the same one hour walk this morning, and saw our last mammal – a pair of waterbuck, not endemic but introduced to the reserve. Just looking back through our notes, and it turns out that apart from our arrival day in South Africa we have seen at least one new mammal every single day of our trip, with no exceptions. Nice. So if I had to pick a favourite location from our trip, I’d probably go for Erongo; useful staff, lovely accommodation, beautiful landscape, interesting wildlife. Erindi, for all it’s luxury, just leaves me cold. The best wildlife lodges feel like you are living in the wilderness. Erindi feels like a bubble of hotel comforts and green lawns rudely inserted into the wilderness. Back at the airport now. Windhoek International Airport is a little bit low on entertainment. I’ve enjoyed our trip around Namibia. It must be one of the best places for wildlife in the world. It definitely hasn’t always been comfortable. The heat is immense. The landscape can be bleak-beautiful and bleak-ugly. The food at wildlife lodges is very average. The customer service everywhere is hopeless. But the country looks and feels friendly. And the desert sand is so very, very red. This entry was posted on Saturday, October 28th, 2017 at 9:17 pm	and is filed under Namibia. You can follow any responses to this entry through the RSS 2.0 feed. You can leave a response, or trackback from your own site.